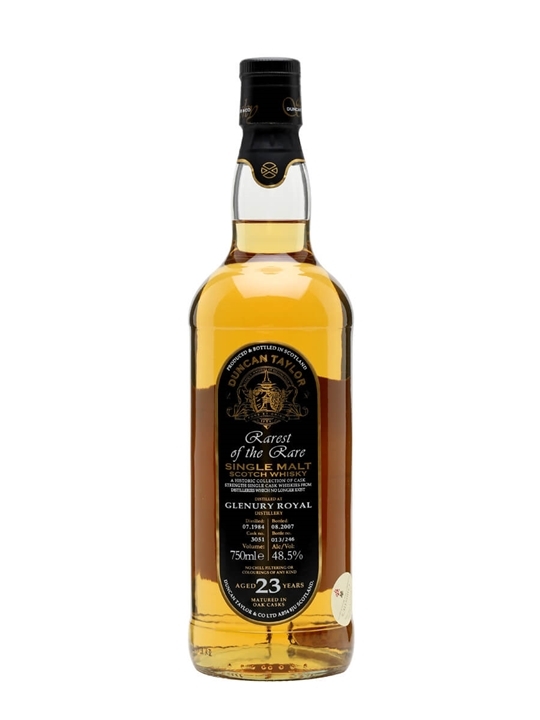 Glenury Royal was founded in 1825 near Stonehaven, Aberdeenshire in the Eastern Highlands by Captain Robert Barclay. The name of the distillery was taken from the nearby Glen in the district of Ury. Barclay himself was a colourful character. As well as being the Laird of Ury and the local MP, he was also a famous athlete who had walked from London to Birmingham in two days in 1799. He also had the somewhat peculiar distinction of being the first person to have walked 1000 miles in 1000 hours, a feat he accomplished in 1808. Summary: This exclusive lot is limited to 430 bottles. An absolutely stunning release from Gordon & MacPhail in their Rare Old range. Distilled back in 1984 and bottled – 2012. Lot: RO/12/05 Bottled at a strength of 46% vol. Tasting note: Crisp and fresh with green apples and fresh vanilla. 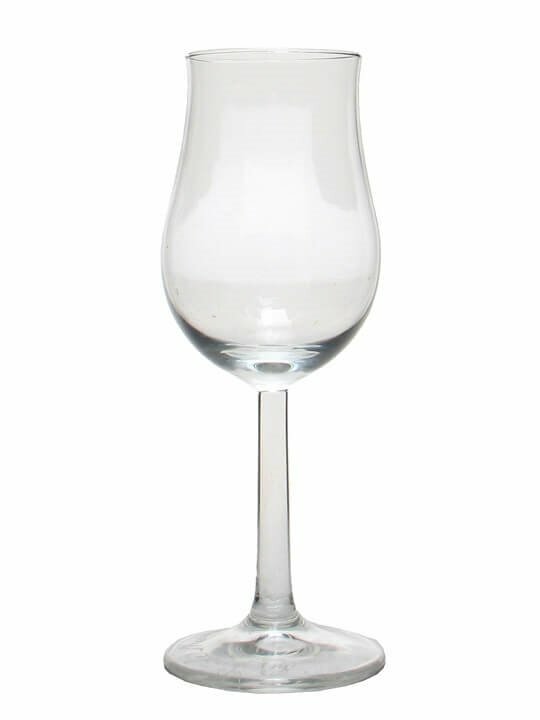 The palate has chilli spice flavours with a floral edge and a hint of dark chocolate Distilled at Glenury Royal Distillery. 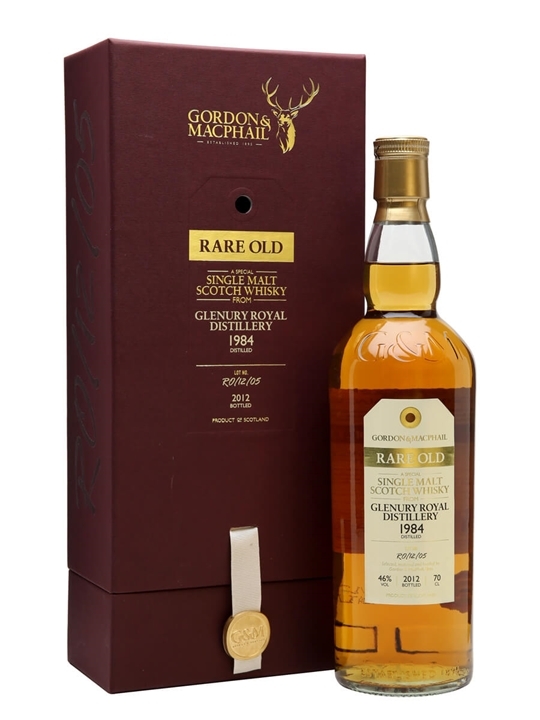 Summary: 70cl / 46% / Gordon & MacPhail – A 1984 vintage Glenury Royal released as part of Gordon & Macphail's Rare Old collection of hard to find single malts. Fortunately G&M have well stocked warehouses and they managed to pick up a few casks of whisky from this lost distillery before it was mothballed in 1985. It has since been turned into apartments. Summary: 75cl / 48.5% / Duncan Taylor – Duncan Taylor's 'Rarest of the Rare' series showcases a range of single cask, cask-strength malts from distilleries that no longer exist. Summary: 70cl / 57.9% / Distillery Bottling – One of only a handful of long-aged distillery-bottled releases of Glenury Royal. 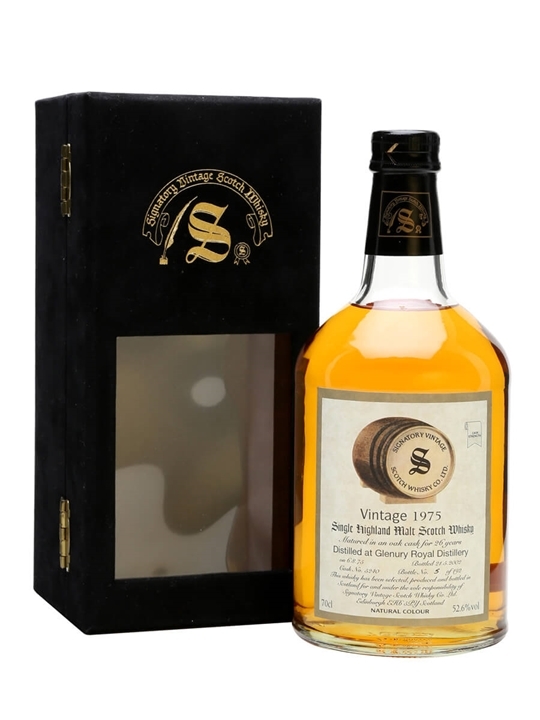 This 1970 vintage is very special whisky from a tragically lost distillery. Impeccable cask selection has led to perhaps the best of Diageo's recent releases from Glenury. 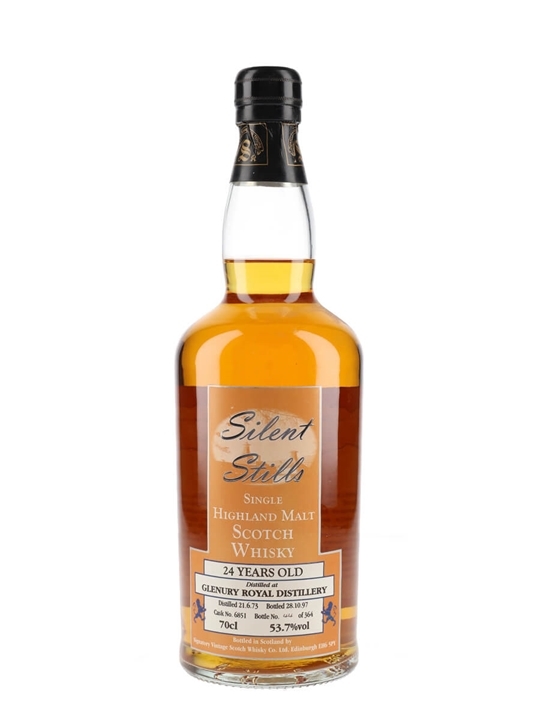 Summary: 70cl / 53.7% / Signatory – A late 1990s bottling of a single cask Glenury Royal 1973, bottled at full strength for Signatory's Silent Stills series. 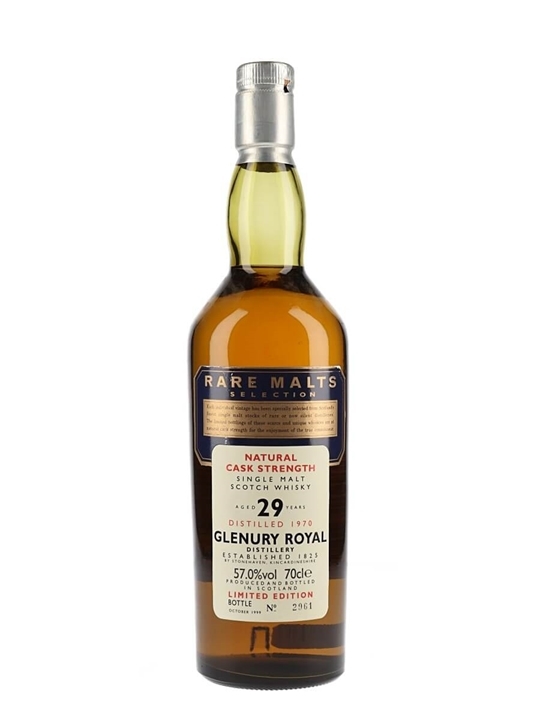 Summary: 70cl / 49.7% / Signatory – A cask-strength release of Glenury Royal from independent bottler Signatory. 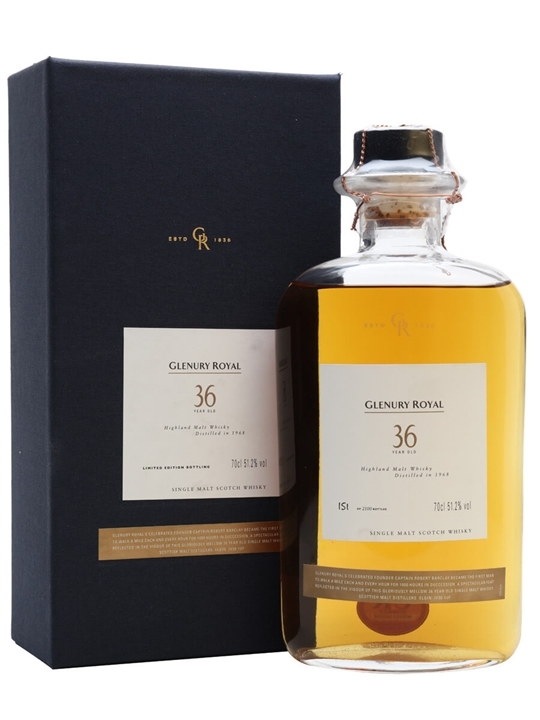 This was distilled in 1973, aged for 30 years in Sherry cask and bottled at 49.7% ABV. Only 168 bottles were drawn from cask #6860. 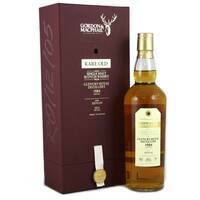 This whisky is full bodied, complex, with characters of dried fruits, oils and white pepper. 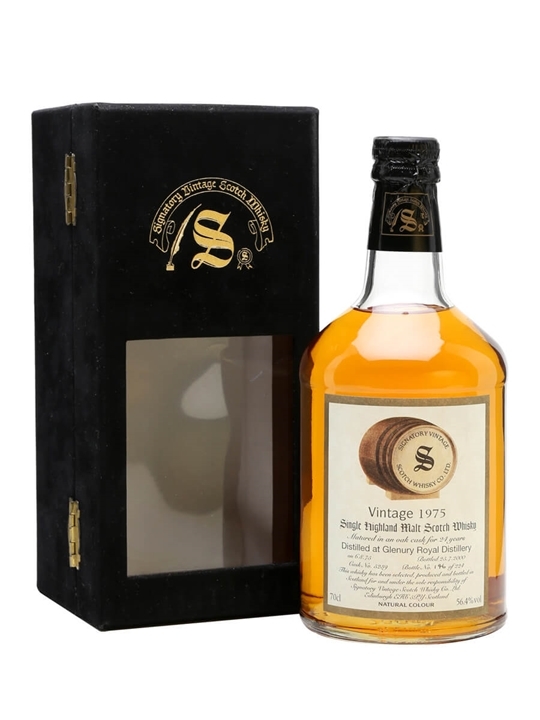 Summary: 70cl / 57.2% / Signatory – An old bottling of Glenury Royal by Signatory – a single cask of 1975 vintage whisky matured for 23 years. 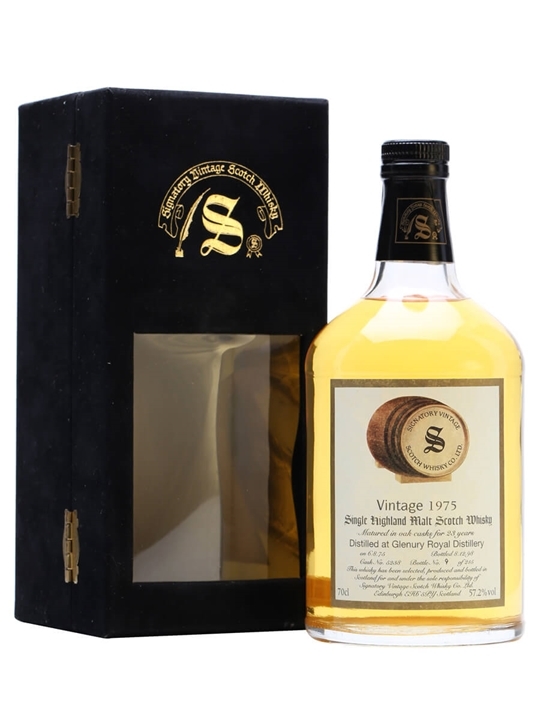 Summary: 70cl / 56.4% / Signatory – An24-year-old bottling of Glenury Royal by Signatory. This single cask was distilled on 6 August 1975, and bottled on 25 July 2000. 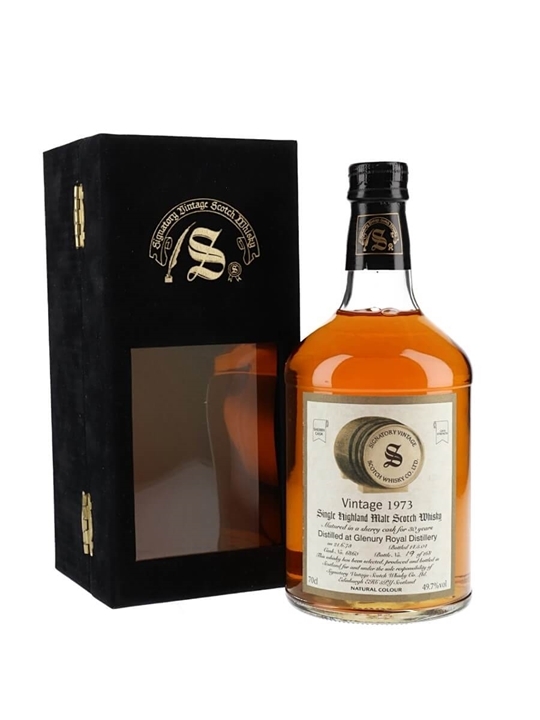 Summary: 70cl / 52.6% / Signatory – An old bottling of Glenury Royal by Signatory. 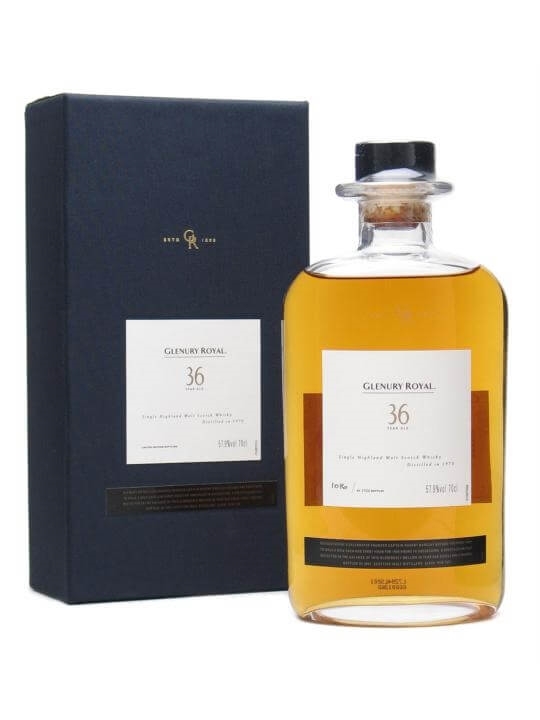 This single cask was distilled on 6 August 1975, aged for 26 years, and bottled on 21 May 2002. Summary: This whisky is 29 Years Old. Summary: 70cl / 51.2% / Distillery Bottling – A brilliantly-balanced mouth-coating beauty, this Glenury Royal is a very special whisky from a tragically lost distillery, and we've always been surprised that it didn't sell out years ago – especially after a 92 point review from Whiskyfun. 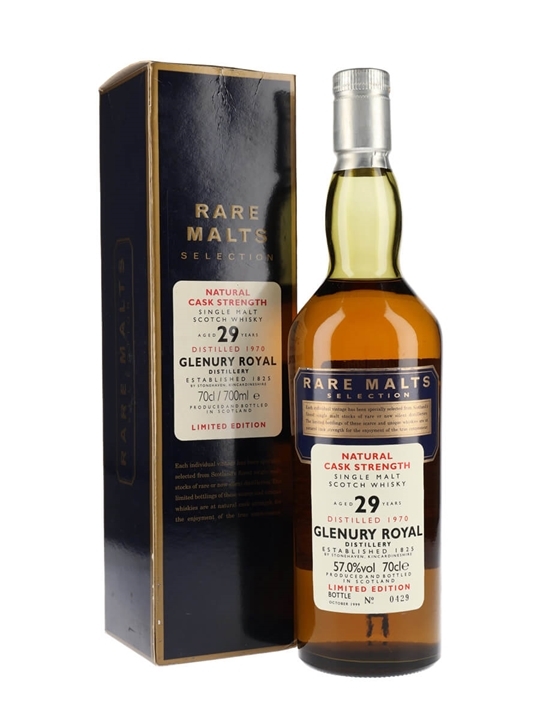 Summary: 70cl / 57% / Distillery Bottling – A 1970 vintage Glenury Royal matured for 29 years and released as part of the Rare Malts series at the turn of the millennium. The distillery was sadly one of the many victims of the 1983 closures. 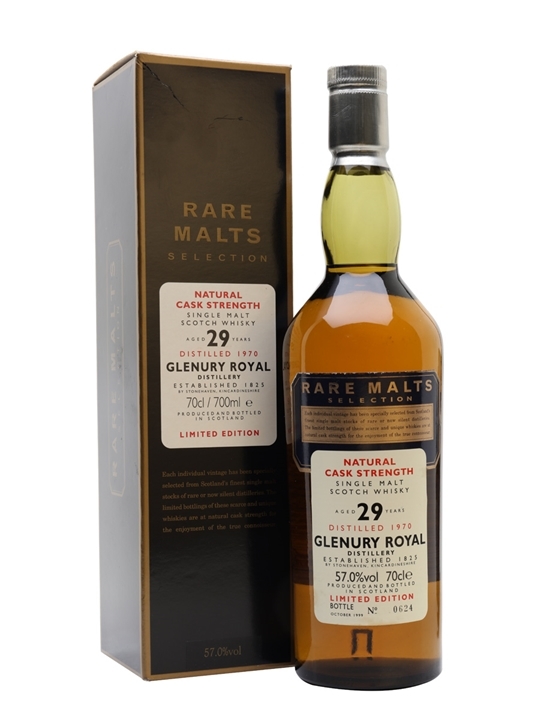 Summary: 70cl / 57% / Distillery Bottling – A special 1970 vintage Glenury Royal which was specially selected to be part of the Rare Malts series. Matured for a full 29 years and bottled at cask strength. 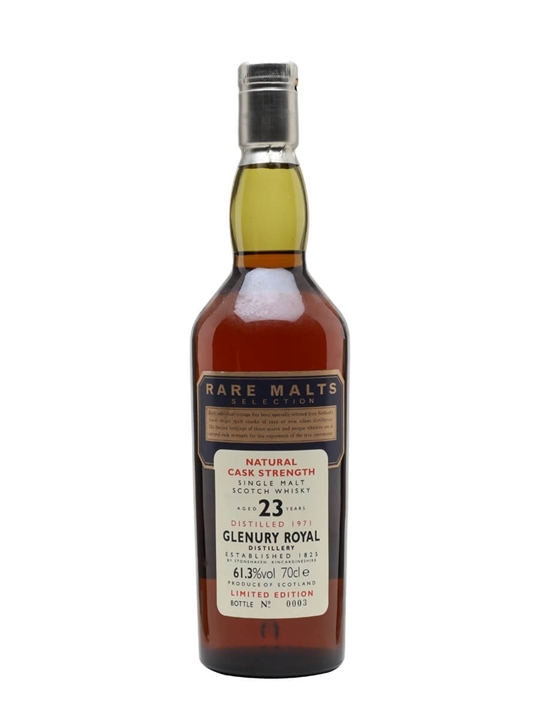 Summary: 70cl / 61.3% / Distillery Bottling – A 1971 vintage Glenury Royal released by Diageo as part of their Rare Malts series of bottlings. The distillery was one that didn't survive the cull of 1983 and has since been demolished. This version was produced for the French market, whose back label it carries.